Talented people made this movie, but there is no point in pretending that the result is anything other than disappointing. Quinn Martin, who produced some outstanding crime dramas, tried his hand here at a Western. Unfortunately and uncharacteristically, Martin was unable to put together a solid crime story, strong characters, and a colorful backdrop. The movie's dabbling in sentimental, moralizing subplots, which have never been Martin's strength, only made matters worse. The movie does not get high marks for creating a sense of place. It is tied down to a standard few sets and street shots, depicting an old southwestern town in a competent but not particularly noteworthy way. The mud in the streets sticks in the mind more than anything else. The story is plodding and uncomfortably overlong for the minimal payoff. It fails to create interesting supporting characters or viable suspects for the early sword-slash murder of a prostitute. The killer is a marginal, cardboard character. The character has little screen time, is almost immediately suspected, and is quickly after being introduced -- yet too long before the movie ended -- shown to be guilty. The explanation of the killer's behavior is labored and trite. Although the movie tried to differentiate the characters, they are weak. On hand as the sheriff was excellent tough-guy character actor Jim Davis, along with a number of lesser lights as his deputies. 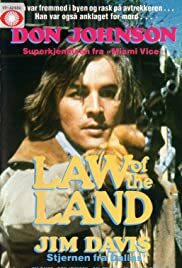 Cal Bellini turns in a decent performance as a moody, scrappy deputy; Glenn Corbett acts for the short time he was on screen with solid, deadpan authority as another; and Don Johnson is annoying yet sometimes likable as an always-grinning, dead-eye-shot con-man-turned-deputy. But neither Davis nor his men do virtually anything to investigate or solve the crime. The solution largely falls into their laps due to a lack of any other serious suspects, due to some shoe-prints, and due to one of them happening to be in the right place at the right time to see the killer running away from an attempt on a second woman. Because he was given little worthwhile to say or do, and was forced in every other scene to grin to show that he was an avuncular softy at heart, Davis' character has far less edge or interest to it than the roles in which he has shined. His emotional outburst at one killing adds nothing deep or lasting to the story and seems like a gimmick. Nicholas Hammond is relegated to a stiff, cardboard role as a staid, button-down deputy, married to Darleen Carr. Carr is always natural and lovely on screen, but the movie is trying so hard and clumsily to make her into a "spirited" and "liberated" foil that the character comes across as shrill, loud, and forced. The movie presents Barbara Parkins' character in a similarly heavy-handed manner, again as if to fit a mold. Meant to convey proud defiance of shame or scorn, she dresses and acts like a surly, aloof, over-age débutante rather than as a mature, flesh-and-blood people person. She is simply tiresome and unbelievable as a prostitute who becomes the killer's second target. Parkins' best moment is when she opens up slightly to Bellini, but that short scene has stiff, cliché aspects of its own. Jim McMullan adds nothing as a quickly dismissed cavalry lieutenant suspect, supposedly a love interest of the drippy, whiny, undeveloped first victim. The movie is weakened, not strengthened, by its subtext of "human dignity" themes. These are played out in subplots about the town's treatment of prostitutes and its treatment of an overblown but poorly drawn character played by Moses Gunn (another character, like Parkins', presented in a forced, stilted way to show "dignity" in the face of disrespect, in his case based on race). While well-meaning, these subplots are handled in a heavy-handed, contrived, superficial way; they feel artificial and merely tacked on to the main story, which they bog down; and they smack of amateurish political correctness. They only succeed in further sapping any genuine drama, suspense, or interest. The familiar names in the production team and cast make it tempting to give this movie a pass based on good will or nostalgia alone, rather than merit. This may well be driving much of what little recorded reaction there is to this film. It seems to consist of a few lines of vague, gushing praise that skims over any flaws. Or, worse, it consists of lazy, unintelligent flicking of the "not helpful" button from the sidelines on any review that takes the subject seriously enough to try to give a full discussion of it, including its faults, instead of treating it like some sort of sentimental, proprietary favorite. Such superficial reactions utterly fail to come to grips in any meaningful way with the details of what is actually on the screen; say almost nothing useful; contribute to the impression that TV viewers are suckers; and can be downright embarrassing to anyone interested in serious reviews, not mindless boosterism or popularity contests. This movie is not embarrassingly bad. But it is stolid, mediocre, and unmemorable, despite the involvement of some accomplished people. The slim commentary on this site itself shows the film's obscurity. If this movie was a pilot for a TV series, it is no wonder that it did not sell. For a failed Quinn Martin pilot that is better, see Travis Logan, D.A., with Vic Morrow, Hal Holbrook, and Brenda Vaccaro.